Curious about how to throw a virtual book launch party? 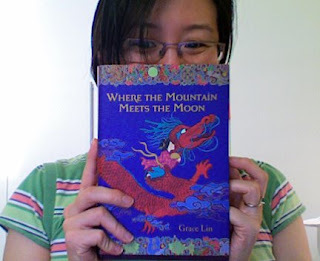 Stop by Grace Lin's launch of her enchanting new fantasy WHERE THE MOUNTAIN MEETS THE MOON (Little Brown). We're enjoying goodies, contests, giveaways, and the eternal hope of cupcakes. Find out more about this lovely novel, which I want to read aloud to every upper elementary kid on the planet. Kirkus, School Library Journal, and Booklist all starred it, and Booklist said, "Children will embrace this accessible, timeless story about the evil of greed and the joy of gratitude."